Session Focus: FUNdamental session focus on developing ABCs and introducing dribbling. 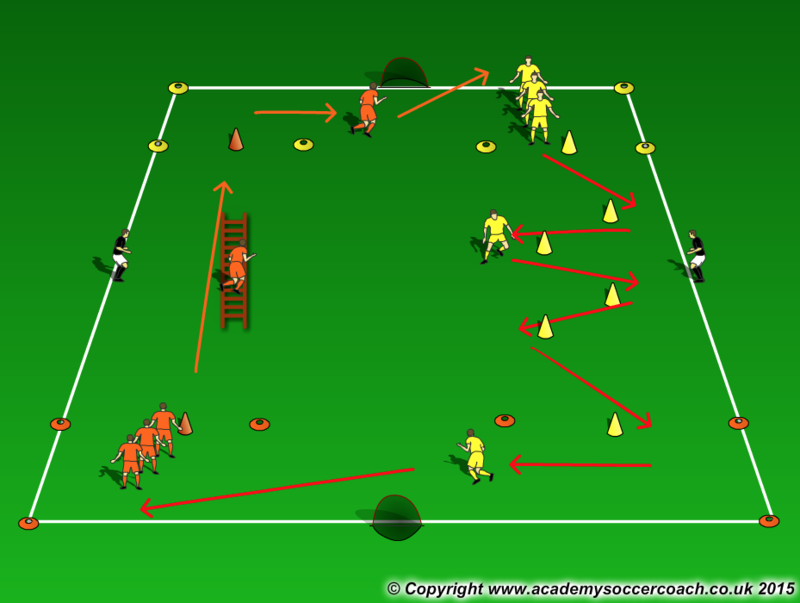 Description: Players split up into two teams, one team starts at the agility ladder and the other at the shuttle cones. Ladder: Players take turns to go through agility ladder, begin with one foot in each square. Progress to two feet, bunny hop and side to side. Shuttle Cones: Focus on knees bent and pushing off the outside foot. Can also progress to running backwards depending on the group. Description: Players in two teams, each player has a ball. Play begins with the whole team in their end zone with their foot on top of the ball. When the coach shouts “GO” players must dribble/walk across “the sea” to the other side. If the player can get to the other side without losing control on their ball, and put their foot on top and shout their name they get 1pt. Speed – When players are comfortable, give the first player who gets across and has their foot on the ball 1pt. Description: Both teams stand in a line beside the coach with one ball per team. When the coach shouts go the players must dribble their ball down the end line, in through their end zone and attempt to dribble and score in the opposite goal. Whichever team scores first gets a point. Players must then lift the ball and give it to their next team mate. 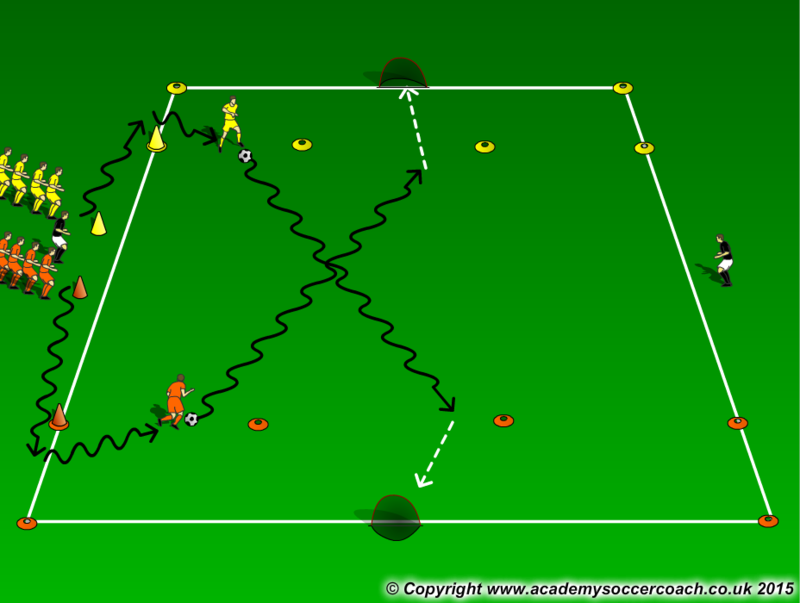 1 Ball, now the players run round the cone and the coach serves in the ball, players must then win a 1v1 to score. End Zone – Players must be inside the end zone to score. Description: Finish with free play, 3v3 / 4v4 max. Can use goalkeepers depending on the group. Allow players to kick the ball in from the sideline and a free pass for goal kick. Ideally have two games of 3v3 and swap teams half way through.